US, 1937, 73 minutes, Black and white. Kay Francis, Errol Flynn, Ian Hunter, Frieda Inescort, Herbert Mundin. 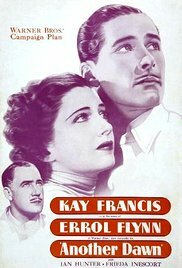 Another Dawn is a brief romantic drama from Warner Brothers in the mid 1930s, featuring Kay Francis who was dominant at Warner Brothers up to this point along with the newly emerging Errol Flynn who’d made such an impact in Captain Blood, Charge of the Light Brigade. The perennial stalwart, Ian Hunter, is the commander at the post. Frieda Inescort is the other woman and there is a comic turn from Herbert Mundin (who was to be killed in a car accident two years later). We see the two men poring over a map which is Mesopotamia, with comments about the Arabs and the role of the British in this part of the Middle East after World War I – in the light of the next hundred years, especially the activities on the 21st century, the film is a reminder of the role of the West in the Middle East in the 20th century. Kay Francis has a rather dreamlike presence in her films, wistful, passionate yet seemingly detached. Errol Flynn was at the beginning of his career, with plenty of World War II heroism to come. The film originally had Errol Flynn going on the mission but this was changed with Flynn’s growing popularity – and Ian Hunter goes to die. The film was directed by German William Dieterle who was one of the most prominent directors at Warner Brothers in the 1930s was a lot of the biographical films, Emile Zola, Louis Pasteur, Juarez, as well as the Hunchback of Notre Dame. The film has a strong orchestral score by Erich Wolfgang Korngold. 1. A film for the lovers of the Golden Years of Hollywood? Warner Brothers melodramas and romances? The stars? The music of Erich Wolfgang Korngold? 2. A brief film, echoes of the British Empire, government in the Middle East, clashes with Arab tribes? Hostility towards Muslims and “heathens”? 3. The romantic elements – predictable? The bachelor committed to his duty, the encounter with the wistful American woman pining for the death of her lover, the dashing second-in-command, heroic sister and her platonic love for the officer? 4. A dialogue film, the discussions about war and heroism, the discussions about relationships, the discussions about fertility and infidelity, about honour? 5. John, the Middle East, his command, Grace admiring him but his not noticing? His reliance on Denny? His practical administration? The ship going back to England, the encounter with Grace and saving her from the intrusive businessmen, their talking, finding themselves together at the English stately home, the golf encounter, discussions, his falling in love, satisfied with respect, the marriage, returning to his post? 6. Julia, American, on the cruise, the encounter with John, his love for her, her story about the pilot and his death, three years, wistful? Her decision to marry? Arriving at the post? Meeting Grace, Denny, unpacking, making a life at the post? John and his having to go out on his duty, his absence? Interactions with Denny, dressing up for the dinner, the walk, the kiss, her demanding that they forget it? 7. Denny, the Errol Flynn type, in action, in command while John was away, urging him to return, the situation in Mesopotamia, the Arabs, the dam, the local soldiers, deals? Denny going out with his men? Their being massacred? Wilkins getting the final rounds, firing them, Denny wounded, returning, in hospital, recovering, Julia finally coming to see him? 8. Grace, Denny’s sister, her devotion to John, keeping in the background, her explanations to Denny? 9. Wilkins, his running away, the box of white feathers, the disapproval of the men? His service to John? His asking to go with Denny, his heroism in getting the ammunition, his death? 10. The British soldiers, colonial attitudes? The language about the Moslems and their opposition to Christianity? The language of “dirty, yellow belly heathens”? 11. Julia and Denny, the explanations that they had to separate, John overhearing? Denny and his wanting to go on the mission, his flying his plane, the toss of the coin, John going, the report of his death? 12. Old-fashioned filmmaking, storytelling, characters and situations?